Today at Strange Horizons, Abigail Nussbaum reviews The King’s Last Song by Geoff Ryman. Go and read it, because it’s an excellent review, and because if you don’t the rest of this post will make no sense at all. Ryman’s earlier novels reveled in the wildly fantastic and the outright bizarre—lesbian polar bears in the far future, Oz’s Dorothy as a bitter victim of sexual abuse, a retelling of The Spoon River Anthology for the modern, commuter era—which he couched in playful, experimental narratives. With his most recent and extremely well-received novel, Air: Or, Have Not Have, Ryman moved away from these tonal and stylistic excesses. Air‘s prose was transparent and precise, its narrative largely linear and, apart from one technological innovation, set in a world much like our own. The King’s Last Song completes this transition—it is a thoroughly naturalistic novel (no biologically unlikely pregnancy in sight), and by far the most subdued thing Ryman has ever written. Niall Harrison: This is obviously a point you refer back to a few times. Unfortunately, while I’ve read early Ryman (Unconquered Countries, The Warrior Who Carried Life) and later Ryman (253, Air), I haven’t read much from the middle (so not The Child Garden or Was). But I’m not certain that Air is as much a departure in terms of tone and style as you suggest. Abigail Nussbaum: I’m exactly the opposite, but you’re right that in something like “The Unconquered Country” Ryman’s language and tone aren’t as adventurous as they would later become. NH: Although to undercut my argument completely, there’s a story in the same collection as that story called “A Fall of Angels”, of which about half is a conversation between two posthumans and a being that might or might not be an alien, carried out entirely through pictograms. But something like The Warrior Who Carried Life, his first novel, certainly has the storybookishness you mention with regards to TKLS’s historical segments—it feels like Ryman is trying to strip out as much window-dressing as possible, and get down to the pure story. Which is very imprecise, but I can’t think of a better way of putting it right now. It’s wildly fantastical, but the fantasy is deliberately described in plain, matter-of-fact terms, and avoids the high tone of most such ‘epic’ stories. The characters are (IIRC explicitly) archetypal, rather than being individual and nuanced. And so on. AN: This is precisely what he does in the historical segments of TKLS, especially the characters. The really puzzling thing is that you’d expect an author who retells an epic story in, as you put it, plain terms to be aiming for psychological realism. But then he turns around and makes the characters inhuman, so that they feel completely out of place and all emotional resonance—the emotional pull of the epic story and the empathy we might develop with realistic characters—is lost. I have no idea what he’s trying to do. NH: I wonder if it isn’t in some way deliberately symbolic. Most fantasy isn’t deliberately symbolic—indeed most fantasy aims for the opposite, I would say, burying its symbolism under worldbuilding. I wonder if Ryman might be trying to point out the artificialiality of history, or the risks of making fantasy out of it. Or something. AN: I think I’d be very unhappy to think of Ryman trying to manipulate his readers in this manner. I, for one, read the historical segments expecting them to attempt some version of realism—clearly Ryman can’t tell me exactly what happened, but his speculation can have the ring of psychological and political truth. It’s a little disturbing to consider that Ryman might have been lambasting me for something I had never intended to do. NH: You could also say it’s the side of Jayavarman’s life that the leaves don’t tell us (since the two accounts clearly, and I think deliberately, conflict), but that brings us back to your problem of the lack of verisimilitude. Alternatively, I wonder whether it’s meant to be the version of the past that, say, Map remembers before reading the leaves. Its message is essentially that Jayavarman existed, but everything inevitably fell apart after him, and even he wasn’t perfect, just as everything always falls apart and nothing is perfect in Cambodia. The leaves, precisely because they leave out the real person, provide the sort of aspirational hope that myths provide. They reclaim the past as something to believe in—in contrast to, say, the 20th-century memories of Map and others. AN: Are you sure that Map doesn’t know how things worked out for Jayavarman and his heirs? When the book is found, there’s a second, smaller, packet of golden leaves that’s separately wrapped. I had assumed that this was the crippled son’s tragic epilogue, although I don’t remember whether Luc translates it as well as the book itself. NH: Yet another thought: you say in your review that it’s “by far the most subdued thing Ryman has ever written”—and in terms of being extravagant/fantastic, that’s spot-on, but in terms of emotion…? It occurs to me that one reason Ryman’s books work the way they do is because he is unashamed of extremes of sentiment—very good and very bad things happen to his characters all the time–but tells them in a very matter-of-fact way. I thought Map’s recollection of his time in post-Khmer Rouges Cambodia was one of the strongest parts of the novel for precisely that reason. (And it occurs to me that that section, which effectively operates as a novella within the novel, is set at about the time that ‘The Unconquered Country’ was written—must compare the two at some point.) On the other hand, while I agree that the impact of the historical strand isn’t what it might have been, I’m not sure I agree that Jayavarman’s story is uninspiring; the portrayal of the city he creates, for instance, was awe-inspiring, almost like a utopia I never knew existed—which I’m sure was Ryman’s intent. More generally, you also say “the novel’s primary function seems to be to act as a guided tour”, and I think this may be the key to the book—tourism keeps coming up, both as a way people make their living and as an evil, or at least damaging, influence on Cambodia’s attempts to become a whole country. I think the casting of the reader as tourist is vital: I got the feeling that at times Ryman was very deliberately saying to a presumed Western audience, this is not your story. AN: That’s a very nice observation, but it’s not as if Ryman is telling the Cambodians’ story either, is it? NH: Because he’s not Cambodian? I don’t know; he certainly spent a lot of time there while writing it. I’m not sure I buy the argument that no author can ever accurately represent a culture other than their own—it’s too close to saying an author can’t write about people who are different to themselves. AN: No, I meant because he’s more interested in convincing us that Cambodians are good, kind, and hospitable people than in genuinely talking about them as complex human beings—he’s telling the story of Cambodians as he wants us to see them. His politics, however well-intentioned, keep getting in the way of his subject. Have you read Orhan Pamuk’s Snow? It’s a novel that questions the wisdom of writing political novels and the viability of art in the service of a political agenda, no matter how well-intentioned. The book ends with the author asking one of the characters if he has something to say to his (Western) readers. The character responds “If you write a book set in Kars and put me in it, I’d like to tell your readers not to believe anything you say about me, anything you say about any of us. No one could understand us from so far away.” The act of placing an intermediary between ourselves and the people we’re reading about inevitably blurs the resulting image (although another plot strand in the book also deals with problems in face-to-face communication. It’s an excellent read by the way – meaty and dense). Ryman ignores, and even purposefully sublimates, this complexity in favor of his political agenda. NH: You said that about the characters in the book, but I don’t think they’re politically uniform so much as they’re morally uniform. Or to put it another way, I haven’t read a book which believes so completely in the fundamental decency of people for ages. And on one level this is good—the book is brilliant at showing how society crushes and twists people like Map and Rith, and leaves them misunderstanding each other. And then they find a degree of reconciliation, even while I strongly suspect they would disagree with each other on matters of policy and justice. On the other hand, precisely because it’s so optimistic it seems a bit unreal, and therefore at times a little patronising. AN: Which is actually worse, as far as I’m concerned. I don’t want to claim moral superiority for my nation, but are we really going to ignore—is Ryman really expecting us to ignore—the systematic murder of 1.7 million people by the same people that Ryman would have us believe are morally uniform and fundamentally decent? The civil war and its atrocities are the boogeyman in Cambodia’s closet. They poison the lives of people who never experienced them, and yet when Ryman references them, he refuses to assign personal responsibility, to consider that there are Cambodians living today who were intimately involved with this slaughter, who might not be nice people. Even Map, a former Khmer Rouge, is only joined by the narrative after he’s left that group. We’d be up in arms if the novel offered this kind of wholesale apologia for Europeans—Germans during WWII, for instance. NH: No, clearly he doesn’t expect us to ignore it—the Cambodia of TKLS is clearly damaged at every level by the actions of the Khmer Rouge. But at the same time, I don’t think it’s apologia to argue that terrible things can be done by good people. To an extent, I think the novel suggests that any attempt to assign personal responsibility would be meaningless; it’s by taking collective responsibility for their past that Cambodians can move forward. AN: I actually see the novel as offering a collective amnesty – not ‘we’re all responsible’ (which I would have problems with as well) but ‘no one is responsible’. I don’t have serious problems with the notion that good people can do terrible things, or that a person who has done terrible things might deserve compassion, but that’s not what Ryman is doing—rather, he deliberately ignores the fact that there are people who are responsible for these atrocities. In the debate about offering forgiveness to mass murderers and war criminals, there has always been one universally agreed-upon truism—that forgiveness cannot be offered without a full accounting and acknowledgment of responsibility. Also, the one true moment of catharsis in the novel comes when Map takes personal responsibility and confesses to William. NH: Yes, and William’s immediate realisation is that he is a part of the war as well, that he (and by extension every Cambodian) has to face up to his country’s past. I would say. NH: The last thing I wanted to talk about is the ending. I think it works—again, if you like it’s symbolic, giving Cambodians back their history as common knowledge—but you felt it was contrived? AN: It’s a device that falls flat for me. In spite of the fact that he has roots in science fiction, in spite of the fact that he’s written a novel like Air, Ryman chooses to ignore the fact that information, once set loose, can never be contained. Once the translation exists, the book’s physical location ceases to matter. NH: Aren’t we saying two different versions of the same thing, here? I think the point of the ending is that the information is no longer contained—but because it’s equally available to all Cambodians, because it’s being passed on by word of mouth, it’s outside Western control. Whereas if the book had been taken and put in a museum, it would have been in some sense gatekeepered, distanced from Cambodians, even if the actual translation was still made available. AN: See, it’s that last part that I find unconvincing. If the translation is available, why does the book’s location matter? It’s practically the crux of the novel, and Ryman fails to sell me on his outlook on the situation. NH: Simply because symbols matter, I think; because ownership matters, because information isn’t always independent of its context. My knowledge of the cultural heritage of other countries isn’t what it should be, but I’m pretty sure there are various priceless artifacts locked up in the British Museum that come from countries who would quite like them back, please. AN: True, although only to a point. It’s also something that I think Ryman should have worked harder to stress in the novel (if that is indeed his point) rather than hoping we wouldn’t notice the thoughtless conflation of the physical object and the text. You know, I think we mostly agree about the book’s strengths and weaknesses. It’s just that, as you say, you seem to find its flaws less problematic. I think for me the issue was plotlessness and manipulation. One or the other would have been OK, but not both. I would have been able to accept a novel whose purpose was to guide us through Cambodia, but in that case I can’t accept Ryman’s propaganda work. And manipulative novels are usually much more effective when they offer the readers something to grab onto, such as a tight plot. This is really interesting, because Geoff read a new short story (brilliant, natch) at Wiscon called “Pol Pot’s Beautiful Daughter,” which is about this very thing — how the actions of the people who were responsible for the killing and torture continue to haunt their offspring and later generations, and it also offers a view of the people who fought back and their offspring. In fact, it seemed very much as if no one could ever escape these things that had happened until someone took responsibility. So, it’s really, really interesting that pretty much the opposite viewpoint is what’s being extrapolated here. I can’t wait to read this now. Niall is right that the novel is incredibly optimistic and believes in the fundamental decency of everyone, and I think that’s one of the reasons why I like it, because I haven’t read a novel with so much war and death and violence that made me feel so uplifted in a long time. I didn’t see the novel as being a collective amnesty as much as a story of how a country can begin to recover from the terrible events of the past, and the way to that is through the efforts of all Cambodians together – as we see in the case of the translation, by passing the translation on. I think the book shies away from assigning culpability because that’s not what it’s about, and doesn’t seem necessary to do so. One of my problems with the book is that I know almost nothing about Cambodia or its past, and the book assumes a certain basic level of knowledge (had I not been reading it while away from the internet I would’ve been hitting Wikipedia a lot). Maybe it doesn’t try and point out how there were bad people doing bad things in the Khmer Rouge, because it seems as unnecessary as pointing out that some of the Nazis were bad people too. To tie it back to Geneva’s post yesterday, it feels to me like Ryman has written a novel which is so optimistic and positive about Cambodians and their future that it goes too far and feels patronising to some readers. He’s got so close to the source material that it’s not possible to view the novel without it being coloured by his research in a way it isn’t for the average reader. I disagree with Abigail’s assessment that in Ryman’s Cambodia nobody is a victimiser. Everybody is a victim. I think the crucial aspect of Map is that he is both victim and victimizer. His guilt at past atrocities forces him to further atrocities. The ultimate fate of the book offers a symbol in itself. The translation is out in public domain, but had the book itself been recovered there would have been issues of power and possession surrounding it. Instead the essence, the story it contains is allowed prominence. Similarly knowledge of the Khmer Rouge’s crimes (and others) is public but the evidence is no longer necessary, and may even be obstructive. The desire for revenge that it would bring impedes the impulse to re-build Cambodia. If Ryman is optimistic it is in assuming people can leave the need to apportion blame behind in the end. Coming soon in F&SF, I believe. And we really, really need a proper Geoff Ryman short story collection; there’s at least as much uncollected material again as there is in Unconquered Countries, and those stories have been out of print for too long. On optimism: the only book I’ve read recently that compares in terms of sheer belief in humanity is Mary Doria Russell’s A Thread of Grace–a title that could well apply to some aspects of TKLS, and also a novel well worth reading. Liz and Kev are right in describing the two things that Ryman is trying to do with The King’s Last Song – offer the possibility of a bright shining future for Cambodians, and a fantastic path towards that future – but right there is my problem with the novel. As I say in my review, Ryman didn’t convince me that Jayavarman’s words were enough to help heal Cambodia’s soul and, having failed to establish that rapport, the rest of the novel fails to coalesce and becomes preachy and condescending. Liz, do you remember the discussion of Air at the not-BSFA panel in March? Someone pointed out that in many ways, Air is a fairy tale – Mae’s successes and victories are completely unrealistic and in many respects unchallenged, and the novel as a whole is no less optimistic than The King’s Last Song. We all agreed, however, that this artificiality is kept in check – almost unnoticed by the readers – by the fact that Mae is such an overpowering and lovable character. 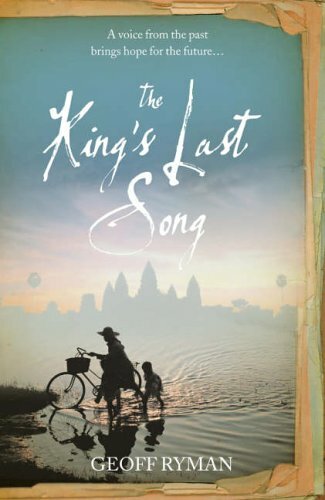 In The King’s Last Song, Ryman sublimates William and Map – who had the potential to be just as appealing as Mae, if given more room to breathe – to his benevolent fantasy of Cambodia’s salvation. The result is that the fairy tale aspect of the novel becomes more noticeable and less palatable. It seems strange to me, therefore, to talk about the novel as having a belief in humanity, since it apparently conveys this belief by robbing its two protagonists of a significant portion of their humanity. Niall, Zara’s panel report from Conflux says there is a new Ryman collection due from Tachyon Press. Hooray! Abigail, I think that because I have fewer problems with the novel I don’t have the problems with the characterizations that you have, and I just didn’t see William and Map as being dimished by the rest of the novel. More cautiously, that’s what someone said on the panel, but Tachyon don’t have it listed as forthcoming, so I am not entirely convinced … different publisher? not yet? wrong info? who knows. Jacob from Tachyon is often at Readercon. If I see him there, I shall interrogate him on behalf of this blog’s groupmind.